Author of The Rise and Fall of Civilizations, Nicholas Hagger examines the alternatives, including global governance, and offers an ideal model, structure and vision for a supranational body of administrators and enforcers supported by experts in international law, and an elected Senate and lower house based on the General Assembly of the United Nations. Together they would operate as a higher tier of government than existing bodies, including nation-states and the UN. He explains how this tier could come into being. This is an accessible and innovative work of modern statecraft that offers a blueprint for a democratic world state with legal authority to end wars, famines, disease and poverty while allowing civilizations to continue their development with local, regional autonomy. Motivated by philanthropic and humanitarian considerations, Nicholas Hagger is concerned to set precise and realistic goals to maximise the world state’s effectiveness and to criminalise the plundering of resources by behind-the-scenes organisations run by self-interested élites. A challenging philosophical vision of a better future for all in the tradition of Plato’s Republic and Kant’s Perpetual Peace. In The New Philosophy of Universalism Nicholas Hagger outlined a new philosophy that focuses on the oneness of the universe and humankind, and its applications for many disciplines, including international relations. 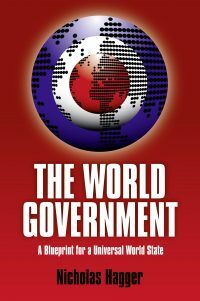 In this work of political Universalism Nicholas Hagger presents the long-yearned-for human dream of world government. In the hands of conquerors or self-interested élites concerned to loot the Earth’s resources to enrich themselves, this could be disastrous. But in the hands of a philanthropic body of experts and elected representatives this could benefit humankind by legislating to abolish war, famine, disease and poverty. A challenging philosophical vision of a better future in the tradition of Plato and Kant, this is required reading for all interested in improving the structures of global governance. Nicholas Hagger’s books reveal truths that have been hidden. His political Universalism brings a new approach to international politics and statecraft.